The Egyptian Museum of Berlin (German: Ägyptisches Museum und Papyrussammlung) is home to one of the world's most important collections of Ancient Egyptian artifacts, including the iconic Nefertiti Bust. 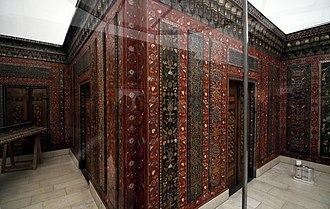 Since October 2009, the collection is part of the reopened Neues Museum on Berlin's Museum Island. 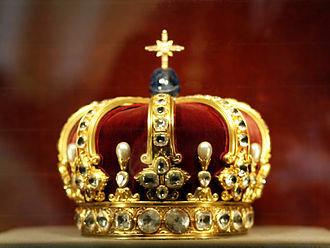 The museum originated in the 18th century from the royal art collection of the Hohenzollern kings of Prussia. 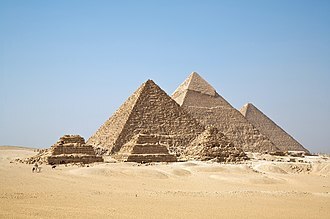 Alexander von Humboldt had recommended that an Egyptian section be created, and the first objects were brought to Berlin in 1828 under King Friedrich Wilhelm III. Initially housed in Monbijou Palace, the department was headed by the Trieste merchant Giuseppe Passalacqua (1797–1865), whose extensive collections formed the basis. 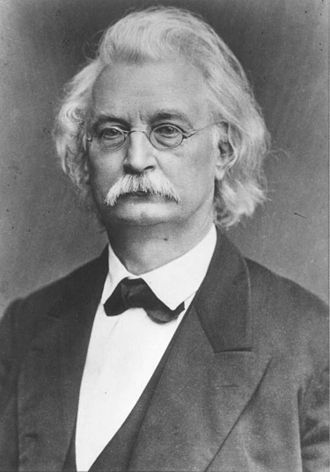 A Prussian expedition to Egypt and Nubia led by Karl Richard Lepsius in 1842–45 brought additional pieces to Berlin. In 1850, the collections moved to its present-day home in the Neues Museum, built according to plans designed by Friedrich August Stüler. The Nefertiti Bust, discovered during the excavations by Ludwig Borchardt in Amarna, was donated to the museum by the entrepreneur Henri James Simon in 1920; it quickly became its best-known exhibit. After World War II, during which the Neues Museum was heavily damaged by strategic bombing, the collections were divided between East and West Berlin. The main part remained in East Berlin and was displayed at the Bode Museum, while those artifacts evacuated to West Germany, including the Nefertiti Bust, returned to West Berlin. 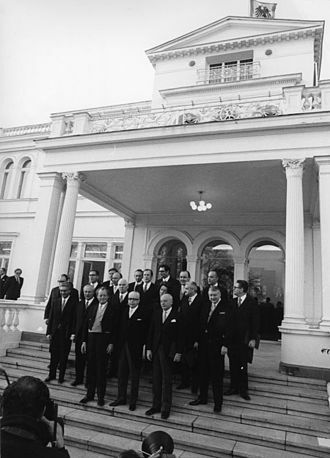 From 1967 to 2005, these items were housed vis-à-vis Charlottenburg Palace. The whole collection was reunited again after the Reunification of Germany, when it returned to Museum Island. The collection contains artefacts dating from between 4000BC (the Predynastic era) to the period of Roman rule, though most date from the rule of Akhenaten (around 1340BC). 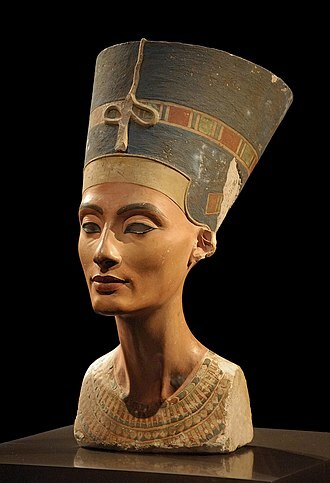 The most famous piece on display is the exceptionally well preserved and vividly coloured bust of Queen Nefertiti. The collection was moved from Charlottenburg to the Altes Museum in 2005 and was rehoused within the newly reconstructed Neues Museum on Berlin's Museum Island in October 2009. 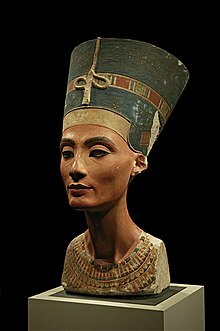 Bust of Nefertiti, 1338 BC. Tai-tai, the Priest. New Kingdom, Eighteenth Dynasty, 1380 BC. Akhenaten and Nefertiti with their children. 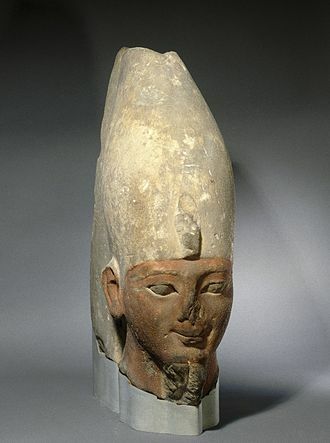 Amarna Period, 1350 BC. 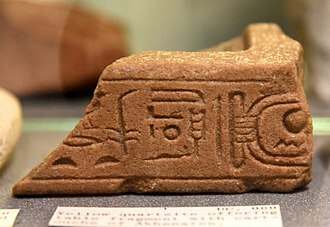 Queen Tiye, Amarna Period, 1355 BC. "Berlin Green Head", 500 BC. ^ a b "Egyptian Museum and Papyrus Collection". Encyclopædia Britannica. Retrieved 24 April 2010. ^ "Egyptian Museum and Papyrus Collection". Staatliche Museen zu Berlin. Retrieved 24 April 2010. 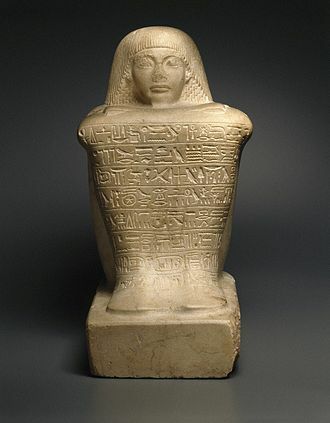 Wikimedia Commons has media related to Ägyptisches Museum Berlin. The House of Hohenzollern is a dynasty of former princes, electors and emperors of Hohenzollern, Prussia, the German Empire, and Romania. The family arose in the area around the town of Hechingen in Swabia during the 11th century, the first ancestor of the Hohenzollerns was mentioned in 1061. They may have derived from the Burchardinger dynasty, the Hohenzollern family split into two branches, the Catholic Swabian branch and the Protestant Franconian branch, which became the Brandenburg-Prussian branch. The Swabian branch ruled the principalities of Hohenzollern-Hechingen and Hohenzollern-Sigmaringen until 1849, members of the Franconian branch became Margrave of Brandenburg in 1415 and Duke of Prussia in 1525. The Margraviate of Brandenburg and the Duchy of Prussia were ruled in personal union after 1618 and were called Brandenburg-Prussia, germanys defeat in World War I in 1918 led to the German Revolution. The Hohenzollerns were overthrown and the Weimar Republic was established, thus bringing an end to the German monarchy, Georg Friedrich, Prince of Prussia is the current head of the royal Prussian line, while Karl Friedrich, Prince of Hohenzollern is the head of the princely Swabian line. Zollern, from 1218 Hohenzollern, was a county of the Holy Roman Empire and its ruling dynasty was first mentioned in 1061. The Hohenzollerns named their estates after Hohenzollern Castle in the Swabian Alps, the Hohenzollern Castle still belongs to the family today. According to the medieval chronicler Berthold of Reichenau, Burkhard I, Count of Zollern was born before 1025, the Zollerns received the comital title from Emperor Henry V in 1111. As loyal vassals of the Swabian Hohenstaufen dynasty, they were able to enlarge their territory. In 1218 the burgraviate passed to Fredericks younger son Conrad I, he became the ancestor of the Franconian Hohenzollern branch. 1150-1155 and 1160, Gotfried of Zimmern, 4th oldest son of Frederick I before 1171 – c,1200, Frederick III/I Count Frederick III of Zollern was a loyal retainer of the Holy Roman Emperors Frederick Barbarossa and Henry VI. In about 1185 he married Sophia of Raabs, the daughter of Conrad II, after the death of Conrad II who left no male heirs, Frederick III was granted Nuremberg in 1192 as Burgrave Frederick I of Nuremberg-Zollern. The eighteenth dynasty of ancient Egypt is the best known ancient Egyptian dynasty. 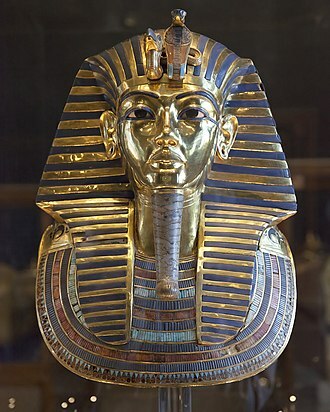 It boasts several of Egypts most famous pharaohs, including Tutankhamun, the dynasty is known as the Thutmosid Dynasty for the four pharaohs named Thutmosis. Famous pharaohs of Dynasty XVIII include Hatshepsut, longest-reigning woman-pharaoh of a dynasty, and Akhenaten. Dynasty XVIII is the first of the three dynasties of the Egyptian New Kingdom, the period in which ancient Egypt reached the peak of its power, radiocarbon dating suggests that Dynasty XVIII may have started a few years earlier than the conventional date of 1550 BC. The radiocarbon date range for its beginning is 1570–1544 BC, the point of which is 1557 BC. The pharaohs of Dynasty XVIII ruled for two hundred and fifty years. The dates and names in the table are taken from Dodson and Hilton, many of the pharaohs were buried in the Valley of the Kings in Thebes. More information can be found on the Theban Mapping Project website, several diplomatic marriages are known for the New Kingdom. These daughters of kings are often only mentioned in cuneiform texts and are not known from other sources. The marriages were likely a way to confirm good relations between these states, Dynasty XVIII was founded by Ahmose I, the brother or son of Kamose, the last ruler of the Dynasty XVII. Ahmose finished the campaign to expel the Hyksos rulers and his reign is seen as the end of the Second Intermediate Period and the start of the New Kingdom. Ahmose was succeeded by his son, Amenhotep I, whose reign was relatively uneventful, Amenhotep I probably left no male heir and the next pharaoh, Thutmose I, seems to have been related to the royal family through marriage. During his reign the borders of Egypts empire reached their greatest expanse, extending in the north to Carchemish on the Euphrates, Thutmose I was succeeded by Thutmose II and his queen, Hatshepsut. 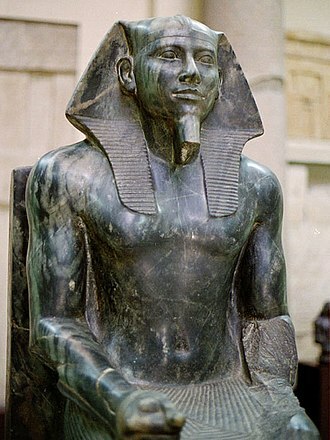 Thutmose III who became known as the greatest military pharaoh ever and he had a second co-regency in his old age with his son Amenhotep II. Frederick William III was king of Prussia from 1797 to 1840. He ruled Prussia during the times of the Napoleonic Wars. Steering a careful course between France and her enemies, after a military defeat in 1806, he eventually and reluctantly joined the coalition against Napoleon in the Befreiungskriege. Following Napoleons defeat he was King of Prussia during the Congress of Vienna which assembled to settle the questions arising from the new. He was determined to unify the Protestant churches, to homogenize their liturgy, their organization, the long-term goal was to have fully centralized royal control of all the Protestant churches in the Prussian Union of churches. Frederick William was born in Potsdam in 1770 as the son of Frederick William II of Prussia and he was considered to be a shy and reserved boy, which became noticeable in his particularly reticent conversations distinguished by the lack of personal pronouns. This manner of speech came to be considered entirely appropriate for military officers. As a child, Frederick Williams father had him handed over to tutors and he spent part of the time living at Paretz, the estate of the old soldier Count Hans von Blumenthal who was the governor of his brother Prince Heinrich. They thus grew up partly with the Counts son, who accompanied them on their Grand Tour in the 1780s, Frederick William was happy at Paretz, and for this reason in 1795 he bought it from his boyhood friend and turned it into an important royal country retreat. He was a boy, but he grew up pious. His tutors included the dramatist Johann Engel, as a soldier he received the usual training of a Prussian prince, obtained his lieutenancy in 1784, became a colonel in 1790, and took part in the campaigns against France of 1792–1794. On 24 December 1793, Frederick William married Louise of Mecklenburg-Strelitz, in the Kronprinzenpalais in Berlin, Frederick William lived a civil life with a problem-free marriage, which did not change even when he became King of Prussia in 1797. His wife Louise was particularly loved by the Prussian people, which boosted the popularity of the whole House of Hohenzollern, Frederick William succeeded to the throne on 16 November 1797. Museum Island is the name of the northern half of an island in the Spree river in the central Mitte district of Berlin, the site of the old city of Cölln. The Neues Museum finished in 1859 according to plans by Friedrich August Stüler, destroyed in World War II, it was rebuilt under the direction of David Chipperfield for the Egyptian Museum of Berlin and re-opened in 2009. It exhibits the sculpture collections and late Antique and Byzantine art, the Pergamon Museum, the final museum of the complex, constructed in 1930. It contains multiple reconstructed immense and historically significant buildings such as the Pergamon Altar, in 1999, the museum complex was added to the UNESCO list of World Heritage Sites. A first exhibition hall was erected in 1797 at the suggestion of the archaeologist Aloys Hirt, in 1822, Schinkel designed the plans for the Altes Museum to house the royal Antikensammlung, the arrangement of the collection was overseen by Wilhelm von Humboldt. The island, originally an area, was dedicated to art. Further extended under succeeding Prussian kings, the collections of art. They are today maintained by the Berlin State Museums branch of the Prussian Cultural Heritage Foundation, Museum Island further comprises the Lustgarten park and the Berlin Cathedral. Between the Bode and Pergamon Museums it is crossed by the Stadtbahn railway viaduct, the adjacent territory to the south is the site of the former Stadtschloss and the Palace of the Republic. These include the Priams Treasure, called the gold of Troy, excavated by Heinrich Schliemann in 1873, smuggled out of Turkey to Berlin and today kept at the Pushkin Museum in Moscow. Then, six months later, Peter-Klaus Schuster took over and set in motion a far more ambitious program intended to turn Museum Island into a Louvre on the Spree. The federal government pledged $20 million a year through 2010 for projects to enhance Berlins prestige and Unesco declaring the island a World Heritage Site. The contents of the museums were decided on as follows, The Pergamon, with the Greek altar that gives it its name, the Neues Museum presented archaeological objects as well as Egyptian and Etruscan sculptures, including the renowned bust of Queen Nefertiti. The Museo Egizio is an archaeological museum in Turin, specialising in Egyptian archaeology and anthropology. It houses one of the largest collections of Egyptian antiquities with more than 30,000 artefacts, in 2015 it received about 772,900 visitors. This exotic piece spurred King Charles Emmanuel III to commission botanist Vitaliano Donati to travel to Egypt in 1753, Donati returned with 300 pieces recovered from Karnak and Coptos, which became the nucleus of the Turin collection. In 1824, King Charles Felix acquired the material from the Drovetti collection, in the same year, Jean-François Champollion used the huge Turin collection of papyri to test his breakthroughs in deciphering the hieroglyphic writing. In 1950 a parapsychologist was contacted to pinpoint them, to no avail, in 1833, the collection of Piedmontese Giuseppe Sossio was added to the Egyptian Museum. The collection was complemented and completed by the finds of Egyptologist Ernesto Schiaparelli and its last major acquisition was the small temple of Ellesiya, which the Egyptian government presented to Italy for her assistance during the Nubian monument salvage campaign in the 1960s. Through all these years, the Egyptian collection has always been in Turin, in the designed for the purpose of housing it. Only during the Second World War was some of the moved to the town of Agliè. The museum became an experiment of the Italian government in privatization of the nations museums when the Fondazione Museo delle Antichità Egizie was officially established at the end of 2004, on April 1,2015 a new layout of the museum was opened. Items of interest include, Assemblea dei Re a term indicating a collection of statues representing all the kings of the New Kingdom. Temple of Tuthmosi III Sarcophagi and books of the dead originally belonging to the Drovetti collection, mensa Isiaca Tomba Dipinta usually closed to the public. The Turin King List The Egyptian Museum owns three different versions of the Egyptian Book of the Dead, including the most ancient copy known. An integral illustrated version and the copy of the First Royal Architect Kha. On more than one occasion the director of the Museum was asked to remove the two copies of the book on display and stock them in a deep and dark basement, at the time of writing, none of these requests appears to have been put into practice. Trieste is a city and seaport in northeastern Italy. It is situated towards the end of a strip of Italian territory lying between the Adriatic Sea and Slovenia, which lies almost immediately south and east of the city. It is located near Croatia some further 30 kilometres south, Trieste is located at the head of the Gulf of Trieste and throughout history it has been influenced by its location at the crossroads of Latin and Germanic cultures. In 2009, it had a population of about 205,000 and it is the capital of the autonomous region Friuli-Venezia Giulia, Trieste was one of the oldest parts of the Habsburg Monarchy. In the 19th century, it was the most important port of one of the Great Powers of Europe, as a prosperous seaport in the Mediterranean region, Trieste became the fourth largest city of the Austro-Hungarian Empire. In the fin de siècle period at the end of the 19th century it emerged as an important hub for literature, Trieste underwent an economic revival during the 1930s, and Trieste was an important spot in the struggle between the Eastern and Western blocs after the Second World War. Today, the city is in one of the richest regions of Italy, Roman authors transliterated the name as Tergestum. Modern names of the city include, Trieste, Trst, Triest, Trieszt, Trst, Serbian, Трст/Trst, Trieste lies in the northernmost part of the high Adriatic in northeastern Italy, near the border with Slovenia. The city lies on the Gulf of Trieste, built mostly on a hillside that becomes a mountain, Triestes urban territory lies at the foot of an imposing escarpment that comes down abruptly from the Karst Plateau towards the sea. The karst landforms close to the city reach an elevation of 458 metres above sea level and it lies on the borders of the Italian geographical region, the Balkan Peninsula, and the Mitteleuropa. The territory of Trieste is composed of different climate zones depending on the distance from the sea. The average temperatures are 5.4 °C in January and 23.3 °C in July, the climatic setting of the city is humid subtropical climate. On average, humidity levels are low, while only two months receive slightly less than 60 mm of precipitation. The province encompassed most of modern-day Egypt except for the Sinai Peninsula. Aegyptus was bordered by the provinces of Creta et Cyrenaica to the West, the province came to serve as a major producer of grain for the empire and had a highly developed urban economy. Aegyptus was by far the wealthiest Eastern Roman province, in Alexandria, its capital, it possessed the largest port, and the second largest city, of the Roman Empire. As a province, Egypt was ruled by a uniquely styled Augustal prefect, the prefect was a man of equestrian rank and was appointed by the Emperor. The second prefect, Aelius Gallus, made an expedition to conquer Arabia Petraea. The Red Sea coast of Aegyptus was not brought under Roman control until the reign of Claudius, the third prefect, Gaius Petronius, cleared the neglected canals for irrigation, stimulating a revival of agriculture. 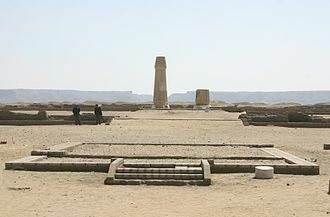 Petronius even led a campaign into present-day central Sudan against the Kingdom of Kush at Meroe, failing to acquire permanent gains, in 22 BC he razed the city of Napata to the ground and retreated to the north. From the reign of Nero onward, Aegyptus enjoyed an era of prosperity which lasted a century, under Trajan a Jewish revolt occurred, resulting in the suppression of the Jews of Alexandria and the loss of all their privileges, although they soon returned. Hadrian, who twice visited Aegyptus, founded Antinoöpolis in memory of his drowned lover Antinous, from his reign onward buildings in the Greco-Roman style were erected throughout the country. Under Antoninus Pius oppressive taxation led to a revolt in 139, of the native Egyptians and this Bucolic War, led by one Isidorus, caused great damage to the economy and marked the beginning of Egypts economic decline. Avidius Cassius, who led the Roman forces in the war, declared emperor in 175. On the approach of Marcus Aurelius, Cassius was deposed and killed, a similar revolt broke out in 193, when Pescennius Niger was proclaimed emperor on the death of Pertinax. The Emperor Septimius Severus gave a constitution to Alexandria and the capitals in 202. The Bode Museum is one of the group of museums on the Museum Island in Berlin, Germany. It was designed by architect Ernst von Ihne and completed in 1904, originally called the Kaiser-Friedrich-Museum after Emperor Frederick III, the museum was renamed in honour of its first curator, Wilhelm von Bode, in 1956. Closed for repairs since 1997, the museum was reopened on October 18,2006 after a €156 million refurbishment. True to the ethos of its director, Wilhelm von Bode, who believed in mixing art collections, it is now the home for a collection of sculptures, Byzantine art. The sculpture collection shows art of the Christian Orient, sculptures from Byzantium and Ravenna, sculptures of the Middle Ages, the Italian Gothic, and the early Renaissance. Late German Gothic works are represented by Tilman Riemenschneider, the south German Renaissance. In the future selected works of the Gemäldegalerie will be integrated into the sculpture collection and this is reminiscent of William von Bodes concept of style rooms, in which sculptures and crafts are viewed together, as was usual in upper middle-class private collections. The Münzkabinett is one of the worlds largest numismatic collections and its range spans from the beginning of minting in the 7th century BC in Asia Minor up to the present day. With approximately 500,000 items the collection is an archive for historical research. Writing in The Financial Times on the occasion on the reopening in 2006, Neil MacGregor, director of the British Museum. Wilhelm von Bode, the manager of the Prussian Art Collections for the Berlin Museum, had spotted the bust in a London gallery. Shortly afterwards, The Times ran an article claiming that the bust was the work of Lucas, lucass son, came forward and swore under oath that the story was correct and that he had helped his father to make it. Albert was able to explain how the layers of wax had been built up from old candle ends, he described how his father would stuff various debris, including newspapers. When the Berlin museum staff removed the base they found the debris, just as Albert had described it, despite this evidence, Bode continued to claim that his original attribution was correct. East Berlin existed between 1949 and 1990 and consisted of the Soviet sector of Berlin established in 1945. The American and French sectors became West Berlin, strongly associated with West Germany, from 13 August 1961 until 9 November 1989, East Berlin was separated from West Berlin by the Berlin Wall. In East German official usage, it widespread in the 1970s to refer to the Western part of the city as Westberlin. 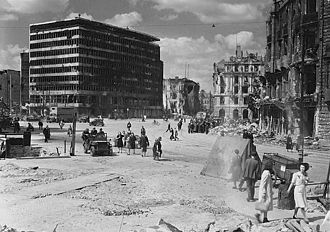 In May 1945, the Soviet Union installed a city government for the city that was called Magistrate of Greater Berlin. After the war, the Allied Forces initially administrated the city together within the Allied Kommandatura, however, in 1948 the Soviet representative left the Kommandatura and the common administration broke apart during the following months. 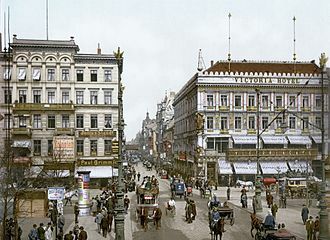 In the Soviet sector, a city government was established. When the German Democratic Republic was formed in 1949, it immediately claimed East Berlin as its capital - a claim that was recognized by all Communist countries, its representatives to the Peoples Chamber were not directly elected and did not have full voting rights until 1981. In June 1948, all railways and roads leading to West Berlin were blocked, more than one-thousand East Germans were escaping to West Berlin each day by 1960. In August 1961, the East German Government tried to stop that from happening by building the Berlin Wall and it was very dangerous for illegal migrants to cross because of the presence of armed guards that were trained to shoot people in such cases. East Germany was a socialist republic, but there was not complete economic equality, privileges such as prestigious apartments and good schooling were given to members of the ruling party and their family. 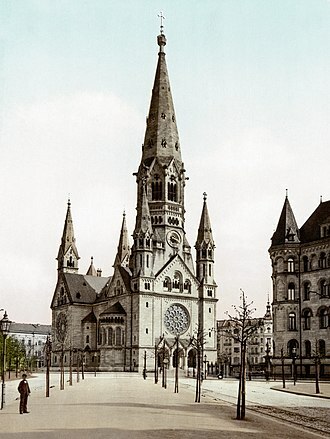 Eventually, Christian churches were allowed to operate without restraint after years of harassment by authorities, in the 1970s wages of East Berliners rose and working hours fell. 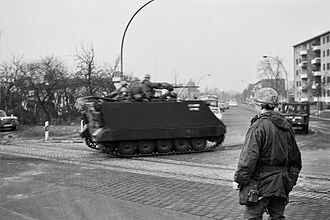 The United States Command Berlin, for example, published detailed instructions for U. S. military, in fact, the three Western commandants regularly protested against the presence of the East German National Peoples Army in East Berlin, particularly on the occasion of military parades. Strategic bombing during World War II was the sustained aerial attack on railways, cities, workers housing, and industrial districts in enemy territory during World War II. Strategic bombing is a strategy which is distinct from both close air support of ground forces and tactical air power. As the war continued to expand, bombing by both the Axis and the Allies increased significantly, in September 1940, the Luftwaffe began targeting British cities in The Blitz. 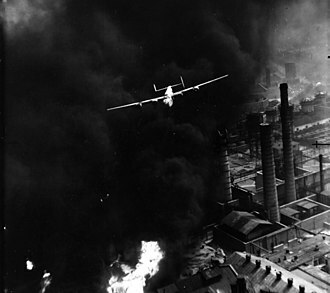 From 1942 onward, the British bombing campaign against Germany became less restrictive and increasingly targeted industrial sites and eventually, when the United States began flying bombing missions against Germany, it reinforced these efforts and controversial firebombings were carried out against Hamburg and other German cities. In the Pacific War, the Japanese bombed civilian populations throughout the war, the effect of strategic bombing was highly debated during and after the war. Both the Luftwaffe and RAF failed to deliver a blow by destroying enemy morale. The Hague Conventions of 1899 and 1907, which address the codes of conduct on land. Despite repeated diplomatic attempts to update international humanitarian law to include aerial warfare, many reasons exist for the absence of international law regarding aerial bombing in World War II. Most nations had refused to ratify laws or agreements because of the vague or impractical wording in treaties such as the 1923 Hague Rules of Air Warfare. Also, the major powers possession of newly developed advanced bombers was a military advantage. Article 25 of the 1899 and 1907 Hague Conventions on Land Warfare did not provide a guideline on the extent to which civilians may be spared. 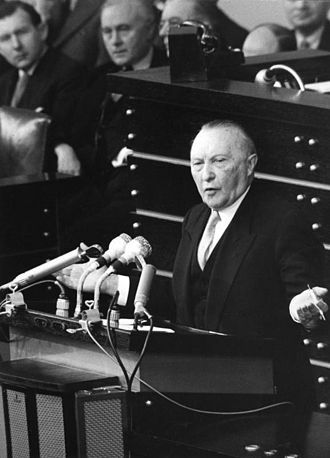 Consequently, cyclical arguments, such as advanced by Italian general and air power theorist Giulio Douhet. Before World War II began, the pace of aviation technology created a belief that groups of bombers would be capable of devastating cities. For example, British Prime Minister Stanley Baldwin warned in 1932, when the war began on 1 September 1939, Franklin D.
West Germany is the common English name for the Federal Republic of Germany or FRG in the period between its creation on 23 May 1949 to German reunification on 3 October 1990. During this Cold War era, NATO-aligned West Germany and Warsaw Pact-aligned East Germany were divided by the Inner German border, after 1961 West Berlin was physically separated from East Berlin as well as from East Germany by the Berlin Wall. 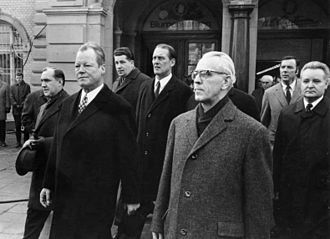 This situation ended when East Germany was dissolved and its five states joined the ten states of the Federal Republic of Germany along with the reunified city-state of Berlin. With the reunification of West and East Germany, the Federal Republic of Germany, enlarged now to sixteen states and this period is referred to as the Bonn Republic by historians, alluding to the interwar Weimar Republic and the post-reunification Berlin Republic. The Federal Republic of Germany was established from eleven states formed in the three Allied Zones of occupation held by the United States, the United Kingdom and France, US and British forces remained in the country throughout the Cold War. Its population grew from roughly 51 million in 1950 to more than 63 million in 1990, the city of Bonn was its de facto capital city. The fourth Allied occupation zone was held by the Soviet Union, as a result, West Germany had a territory about half the size of the interbellum democratic Weimar Republic. At the onset of the Cold War, Europe was divided among the Western and Eastern blocs, Germany was de facto divided into two countries and two special territories, the Saarland and divided Berlin. The Federal Republic of Germany claimed a mandate for all of Germany. It took the line that the GDR was an illegally constituted puppet state, though the GDR did hold regular elections, these were not free and fair. For all practical purposes the GDR was a Soviet puppet state, from the West German perspective the GDR was therefore illegitimate. Three southwestern states of West Germany merged to form Baden-Württemberg in 1952, in addition to the resulting ten states, West Berlin was considered an unofficial de facto 11th state. The iconic bust of Nefertiti is part of the Egyptian Museum of Berlin collection, currently on display in the Neues Museum. In 1989, a 70 pfennig stamp which featured the bust of Nefertiti was on issue in Germany. 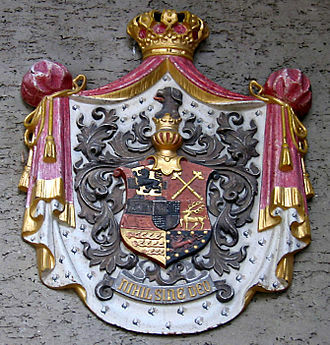 Combined coat of arms of the House of Hohenzollern-Sigmaringen (1849). Humboldt and Bonpland in the Amazon rainforest by the Casiquiare River, with their scientific instruments, which enabled them to take many types of accurate measurements throughout their five-year journey. Oil painting by Eduard Ender, 1856. Brandenburg Gate in Berlin, national symbol of today's Germany and its reunification in 1990. 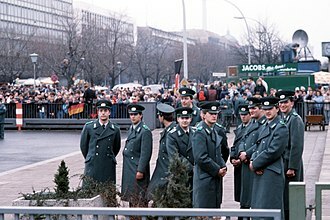 Police officers of the East German Volkspolizei wait for the official opening of the Brandenburg Gate on 22 December 1989. 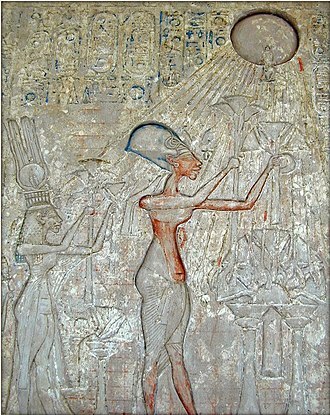 Pharaoh Akhenaten (center) and his family worshiping the Aten, with characteristic rays seen emanating from the solar disk. 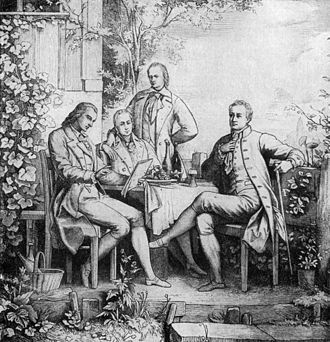 Frederick the Great (1712–1786) was one of Europe's enlightened monarchs.